Distinction: Aconcagua is the highest point of Argentina and of all the Americas, therefore also the highest of the Panamerican Peaks. In fact, it is the highest mountain on Earth outside of the Himalayas. Summit day was cold and tiring, with the final push up the Canaleta very exhausting due to the high altitude. The weather on summit day was near perfect, with low winds and unlimited visibility. We reached the summit after 8h 15m, stayed for 45m and returned in a total time of 11h 45m, comfortably within the lower range of the predicted time range. 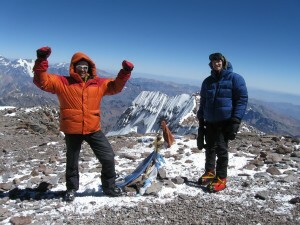 Check the PeakBagger Site on Aconcagua for photos and fast facts. 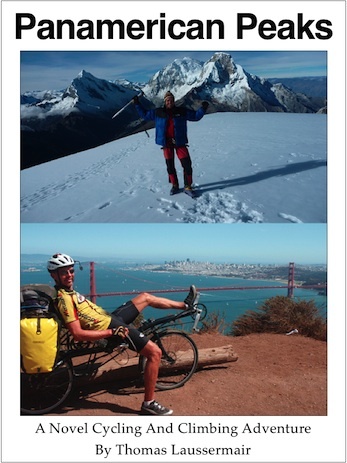 Archived SPOT adventure page for Aconcagua. We wake up at 7am and have breakfast buffet at the Horcones Hotel. Then we get some fresh bread, dish washing soap and some cash before calling a cab to the bus terminal. At 10:15 we load our backpacks and duffel bags with food on the bus and for just 20 pesos (US$5) we get a 3.5 h ride up the Paso Bermejo road which connects Mendoza, Argentina with Santiago, Chile. After a short break (where we buy the eggs and cheese we had forgotten in the hotel refrigerator) we continue up a dry valley along a small river and hills of nearly every color between grey, green, yellow, red and black. At 2700m altitude we reach the landmark Punta del Incas. This is a natural bridge over the river caused by deposits of mineral / ore-rich water from thermal springs. Very unique sight. bags. He also shows us the nearby camp ground, where we proceed to set up our tent. Then we take a 2h walk up the road to the beginning of the Horcones valley, from where we have a brilliant view of Aconcagua against a cloudless blue sky – very impressive! The summit is more than 4000m higher than we are at that point (2900m). from the Canadian Army rations is actually quite good and diverse. evening light up high on the surrounding mountains. Into the tent by nightfall at 9pm and writing these lines. backpack weight, but I guess I still have about 18-20kg to carry today. get going around 12:30. Let the march begin! starting to acclimatize here above 3000m. waste). We cook up a late lunch and then retreat to our tent for 3h of snoozing. Later we emerge again at 7:30pm to take some pictures of the yellow evening clouds and cook some dinner. Now it is getting quite chilly – probably around zero degrees Celsius – and we soon do the dishes, brush our teeth and retreat into the tent again. Today we slept long despite a lot of commotion in the tents around us. need every ounce of water we can get in this dry air! inspirational and so funny at times that I just laugh out loud. expected there are many sites available at this large camp now that we are in low season with a bit less people on the mountain. of severe dehydration which exacerbates the symptoms of Acute Mountain Sickness. The doctors give him a pill against his headache and nausea and tell him to drink as much as he can. Back to the tent his condition improves slightly, but it’s still hard for him to drink much. Good thing tomorrow is going to be a rest day and we can spend time drinking and eating and just recovering from this long, 8.5hr day. rock fall or avalanches, and there are many dust clouds from triggered rock fall. Otherwise everything is quiet again, nothing but brilliant stars and near full moon, as well as a cloud layer in the valley below. Better sleep in the morning hours. breathes warmth and life into the entire camp. it’s illustrious history from many previous expeditions. reach out to my wife via email to give her an update of our situation. ahead; Antoine less so, he is a bit more concerned about the potential rigors and dangers ahead. until 8:45pm when it gets dark and we retreat into the tent again. Two more chapters of the audiobook (Three Cups of Tea by Greg Mortensen), followed by rest with some stretches of sleep. We wake up around 8:30am after less than perfect sleep. We carry our food bag up to the Mallku tent again for breakfast and spend about 1.5h over breakfast. Then we pack enough food for 5 days up high as well as our high mountain cold weather gear in our rucksacks. Around noon we are ready to leave for our carry to Camp Canada at 4900m. Just as we leave base camp there are some snow flurries, and for the next 2.5h the weather stays cloudy and windy with occasional snow showers. After 1h 10min we reach the Conway Rocks (4620m), our turn around point from yesterday. We rest for 10min next to one of the two large Russian groups also coming up here today. Then we continue and after total 2h 35min we top out at the small plateau of Camp Canada (4940m). provides good shelter from wind from N and W.
metal trekking poles a few m away and sit down low to the ground about 10m away from each other. This scenario repeats itself two more times; once I sit down, then when I stand up the static immediately hits me like needles poking into my scalp and I quickly sit down again – a very strange situation which I have never experienced before. everything we don’t need on the upper mountain in the tent at base camp. Internet we finally leave around 1:30pm. We already know the trail and it takes us again 2.5h up to Camp Canada, despite the heavy load and the fresh snow on the trail. above the Andes to Argentina, quite spectacular! We chose a good spot for our supplies and once again drop the red duffel bag with our gear, thus marking the tent spot for us. and more rest for the next hard days. (2h for 4l) and have dinner, followed by another beautiful sunset. Into the tent by 8:30pm. Then we melt snow and have some breakfast. Everything now takes a bit longer at this altitude. We pack the tent as today we are moving up to the next camp. When we finally shoulder our heavy packs and get going it’s about 1:30pm. nice rest stop in the middle. only moderate winds. We set up the tent, prepare both stoves and start melting snow. In fact, both stoves will go continuously for the next 3 hours. Then we have enough water to hydrate and also for our soups and beef stew for dinner. station and chat with two rangers and one visiting photographer. share ‘Mate’, the Argentinean national drink. probably -15C, maybe lower, but luckily no wind. except the heavy backpacks feel weighty on our shoulders and slow our ascent. time working the two stoves (~4h+) than actual climbing (~3h). before the big summit push tomorrow. Neither one of us sleeps well; I lay awake and think about the coming ascent. Unfortunately my throat hurts a bit and my sinuses seem stuffed up; it feels as if I am catching a cold – probably from sitting in the cold wind to melt snow all the time. What a shame, of all days I should not get sick on summit day! Finally we leave and soon we warm up a bit. It feels good to get going. On the Eastern horizon one can already see the sliver of daylight. We follow the head lamp lights of a Russian group ahead of us. Some of them actually turn around after just an hour or so – too cold and exhausting for them! Soon the sun comes up and paints everything in spectacular orange colors. Aconcagua casts a triangular shadow to the West which is very scenic. We take some pictures and proceed to the Refugio Independencia, at 6,400m the highest shelter of its kind in the world. Up here it’s relatively warm, maybe -10C with sun and very little wind, quite nice actually. This changes dramatically as we step out to the long traverse, where a very strong W wind blows across the huge, featureless scree slope. All of a sudden the wind chill plummets and creates extreme, potentially life-threatening conditions! We advance a few hundred meters to a truck-sized boulder which gives a bit of shelter, where we put on our down jacket as an extra layer against the cold. Our next goal is to complete the traverse so as to get out of this wind. At about 6,600m we reach the bottom of the infamous “Canaleta”, a steep slope of rocks and scree leading up to the summit. I am very exhausted after the traverse and seriously consider turning around. But everyone is tired and slow, and we have plenty of daylight left on a beautiful day, so we might as well push on. We leave the backpack here at the bottom of the Canaleta and I only bring 1l of water, the cameras and the SPOT tracker for the OK message from the summit. Going is very tough and slow, after every 10 steps or so I need to rest and take several deep breaths. But I have no headache and everyone else is also equally slow, so I accept the slow progress as inevitable. Another remarkable aspect of these last two hours is the fact that everything seems blurred; I can hardly remember details of the route. I suspect that the lack of oxygen (hypoxia) causes reduced memory and cognitive abilities. But I check myself to ensure I’m still with it and keep going… We also have good conditions, as we can step up on a small band of compact snow on the side of the Canaleta so we can avoid the unstable scree and rocks. After about two hours we reach the ridge between the two summits and can for the first time look out over the South Face way down over the Andes. The view is absolutely breath-taking and there is no cloud in the sky. Now it’s only another 50m or so to the top, and for the first time I know for sure that I will make it. After what seems another very long time both Antoine and I reach the last rock ledge and finally step out onto the flat plateau of the summit! All of a sudden you can see in all directions far down, over all of the Andes, some 6000m down to the low lands of Argentina (East) and Chile (West) – it’s amazing! There is the little iron cross marking the summit, which I recognize from photographs. the highest of the Panamerican Peaks. friends and family that we have made it. I also take some panorama shots with my little Olympus camera, hoping to stitch it together later on the computer. Luckily I have no headache, so I’m not worried about AMS. half the way; now we need to focus on the descent. Not that we are in a hurry, the weather is stable and we still have at least 5h of sunshine to go down. But we need to start and after 45 min we begin our descent. We walk carefully, resting every now and then. A stumble or fall up here near 7,000 m could put you in very serious trouble, as no helicopter can fly this high and everyone is quite busy getting themselves down. Soon we’re back at the bottom of the Canaleta where we deposited our backpacks. We drink some more water and then continue on down. The rest of the descent is fairly straightforward, and after only 3h we are back down at high camp. After almost 12h we’re thirsty, tired, and hungry. happy to have made it to the top, but also eager to make it further down the next morning. We didn’t sleep very well due to the lack of oxygen, dry and itchy throat as well as continuing headache on Antoine’s part. We get up early, dress warmly, pack up our tent and load everything in our growing backpacks for the way down. Once we get going it gets easier and warmer the further we get down. We pick up various deposits of gear, food and trash bags on the next two camps (Camp 2 = Nido at 5,400 m; Camp 1 = Berlin at 4,900 m). We meet with photographer Pablo Betancourt – who works on an Aconcagua photo book and was with us on the summit – at Nido for a quick snack and some water. Further down we soon are back on the slopes between Camp Canada and Base Camp. After some 4h of descending we are 1,700 m lower and reach base camp. Our service provider Mallku cooks up two oven-fresh pizzas for us; the first such food in 2 weeks tastes almost too good to be true! Then we send out some update email to the outside world and finally organize our gear for the mule transport. We also cook some of our own food as we’re still hungry. Just as we walk to do the dishes a strong wind gust blows away some mattresses from nearby provider “Inka expeditions”. We secure a stack of the mattresses with rocks and inform their staff; they thank us for the help and invite us in for tea and desert, a very nice gesture! Soon thereafter we fall asleep in what now feels warm and more oxygen-rich air. We get up early (6:30am) to pack our duffel bags and white rice bags for the mules with our tent and sleeping bags. The idea is that up to 60 kg will be transported by a mule so we don’t have to carry too heavy packs on the long way out. We start hiking down at 7:30am through the Horcones Valley. It’s initially cool in the shadow and windy for the first 2h. Then the sun comes out and we need to shed layer after layer. We have interesting conversations about history of war and conflict, one of Antoine’s special interests. We stop twice for little snacks and water. After 5h we reach Confluencia and have some more peanuts as lunch with fresh water. There is another 2h hike to the park entrance ahead of us and we want to ensure that we’re there by about 3pm so we won’t miss our bus at 4:45pm from Puente de Inca. The trail leads further away from the mountain, offering interesting views all the way up the South Face again. Somehow it looks different now that we stood at the top and have seen the views from up there… After 7h we reach the park entrance and check out – our Aconcagua expedition is now officially over! We have to walk the remaining 4 km to Puente de Inca since no vehicles seem to be willing to pick us up and our service provider doesn’t answer the radio calls. So we continue for another 45 min and eventually get to the little village Puente de Inca where we started 2 weeks ago. We order a big sandwich and coke at the little convenience store and hope to find Osvaldo from Mallku, who should have our bags brought down by the mules by now. I find Osvaldo, but the bags are not here yet! It’s only 15 min until the bus will stop here and leave to Mendoza! Literally in the last 5 min Osvaldo pulls in with the bags in his pickup truck; they had been delivered just-in-time by the mule driver rushing the mules down in time. We are very happy about this, as otherwise we would have been stuck here for another 3h! So we pay Osvaldo, load our stuff into the big bus and then enjoy the 4h drive back to Mendoza. Once there we use a cab to get to the Hotel Argentino in the center of Mendoza, where we book a nice room for the next 2-3 days. I reflect that we are now 6,000 m lower than just 48 hr ago! We are basking in oxygen-rich air, appreciating hot showers, sleeping in clean beds and feasting on juicy Argentinean steaks. In short: We are low again, but definitely high on life!